In the blogging world of fabulous food photography and recipes, this lowly soup is not going to win any awards. But isn’t taste what matters most when it comes to cooking? 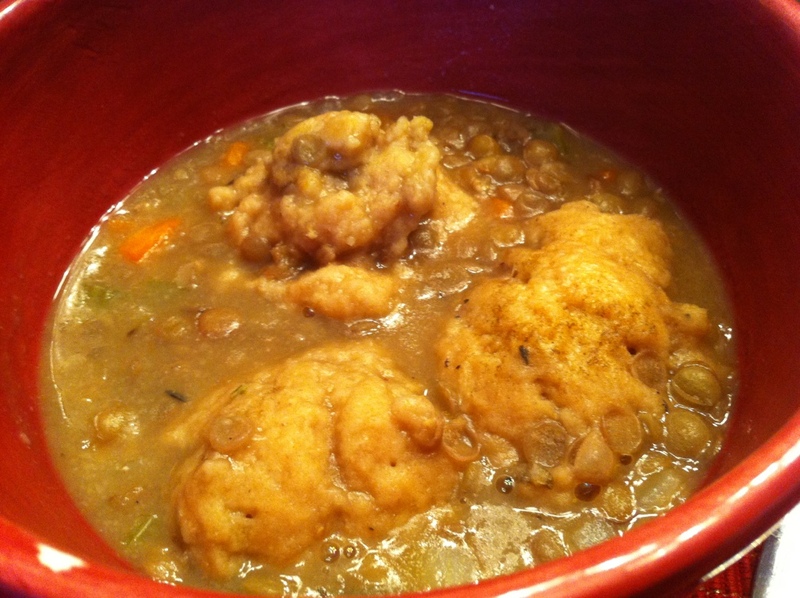 Last night I cooked up a batch of Lentil Dumpling Soup from Hillbilly Housewife. It seems I only make it once every year or so. After last night’s dinner I have no idea why I keep forgetting about it! Last year I made a “no-chop” version with a bag of frozen mixed vegetables. This time I went for the full from-scratch recipe. It does take some time but I enjoyed the methodical chopping, mixing and simmering of the entire process. This time I used Better Than Bouillon no-chicken vegetarian bouillon and a generous pinch of cracked rosemary and dried thyme. I also used white-whole wheat flour to make the dumplings along with homemade oat milk and a flax egg in place of a real egg. But the taste is really, really good. It was so warm and comforting as well as healthy and filling. I am really looking forward to the leftovers for lunch today. I’ve got to make this recipe more often. This recipe is best made on a weekend day or a day you don’t have to work as it takes a good hour or more from start to finish. It makes a nice large amount for a pretty low cost. Benzo and I will get 5-6 servings out of it but we didn’t serve anything else with it. Our toddler turned his nose up at it. Although it is “spring” we are buried in snow here in Kansas. Around 8 inches fell on us over the weekend and it’s not going to melt until later in the week. Booooooo! I am so sick of sweaters and coats and dying for some real spring weather!